Dan Dare’s spaceship on the centre spread of Prog 1 is a marvel to behold, as are the Biogs and the living axe creatures. Sadly none have lasted as characters. 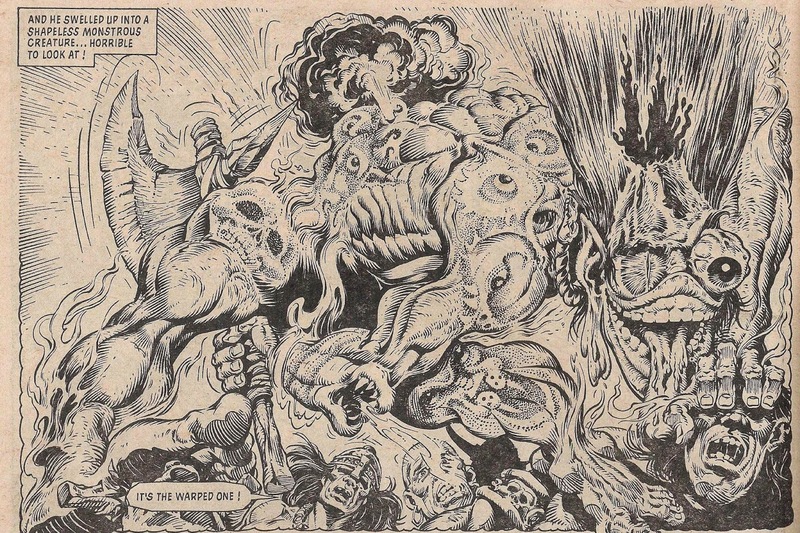 Nonetheless, every time a Deca Thargo (long-term reader) talks about their first progs, they always rave about Belardinelli’s crazy designs, and especailly that first double-page wonder, so I think they deserve a special mention. Pretty much the entire cast of Ace Trucking Co, including the rare feat of coming up with two functionally identical characters, Ace Garp and his doppelganger, who are nonetheless distinct. For the record: Feek the Feek, GBH (Dead), Evil Blood, Evil Guts, and Jago Kain all float my boat. Words by Wagner & Grant. it's all in the point. BlackHawk means what he says. 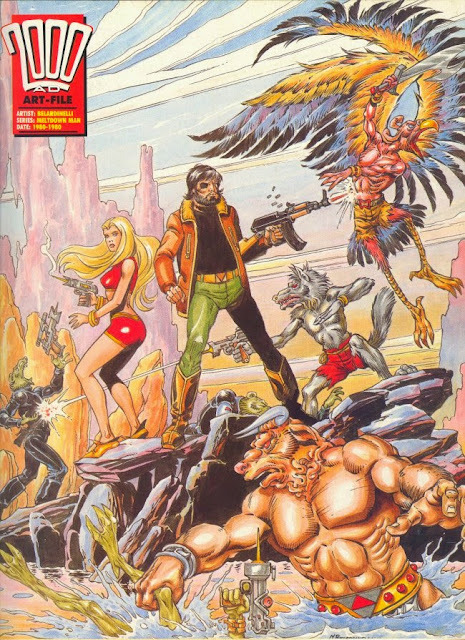 Belardinelli was one of 2000 AD’s original mainstays. For any given Prog from the very first up until the 600s, you’d be more than likely to find his pencils and inks gracing the pages of 2000 AD – the man built up an enormous body of work over a too-short 14 year span in mainstream UK comics. He was another artist in the Ezquerra mould who could churn out page after page of excellent material, and never miss a Prog, even for 50-part epics like Inferno or Meltdown Man. 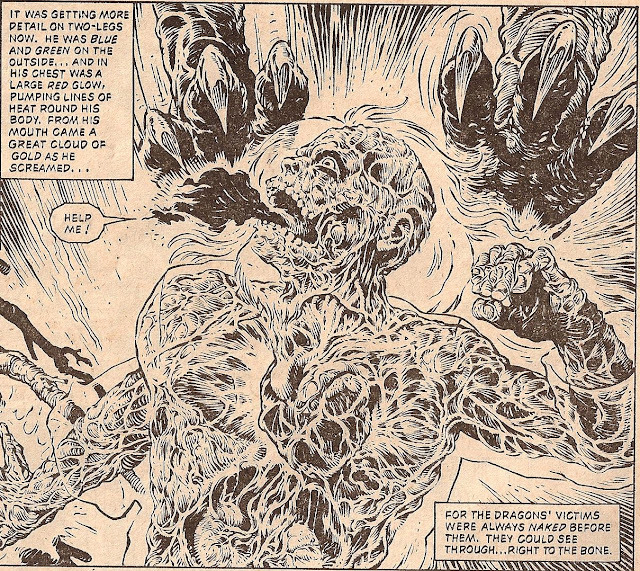 And with the level of detail he crammed in to his panels, that’s no mean feat. This shows how dragons see people - blood first! The received wisdom is that Belardinelli was amazing at drawing spaceships, alien beings and weird worlds – but he couldn’t draw people. I’ll agree there is something about the way he drew people that sticks out – but it’s clearly not that he ‘can’t draw them’. Even alien-fest Ace Trucking Co was full of humans and humanoids (including the three leads, who might have odd faces but have pretty human bodies, don’t forget). 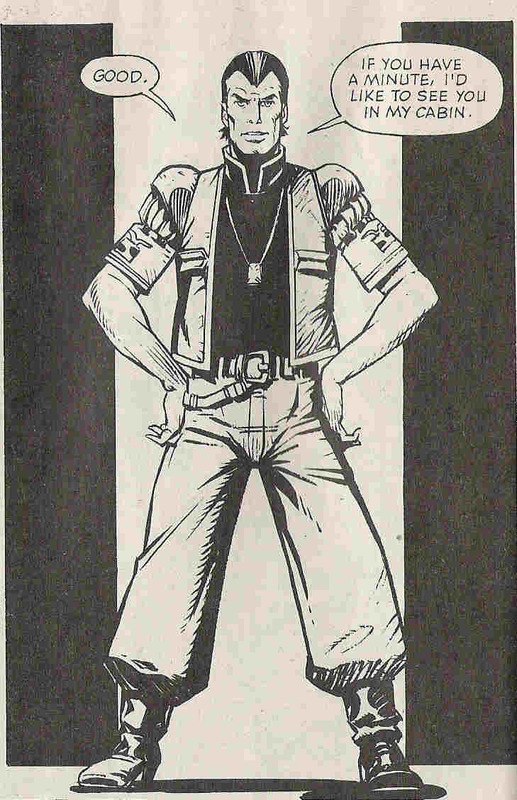 And his run on Slaine was full of gorgeous human depiction. David Bowie or Dan Dare? Just one panel, but it really looks like they're spinning, no? Don't even try to work out where that club started its swing. It doesn't matter - you can feel the hit! It may be wrong on a technical level, but it sure gets across what’s happening. I think in the world of fine art this would count as expressionism*. Whatever the terminology, it lingers in my head every bit as much as the delights of his character and spacecraft design. What I’m saying is, Belardinelli can invoke stuff real good. Later on, he did a heck of a job working up the characters and setting of Moon Runners, the epic that wasn’t. 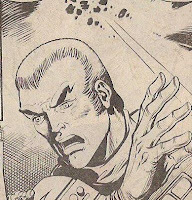 One wonders if the writers ended up being overwhelmed by the fun Belardinelli was having to the extent that they forgot to fabricate an actual story to tell. Captain Flynn rokcs some serious harem pants. The Moon Runners were as bored as the readers. As a go-to artist, Belardinelli holds some kind of record for his Prog count when it comes to Future Shocks, Time Twisters, and general one-off tales (33 individual stories, plus a five-part Tharg story)***. I guess the reality is that, at various times, he didn’t have a big long series to do, but he was too good an artist not to give regular work to. And he always elevated the scripts he was given, designing characters and grounding them in a real place, even if only for a two-page tale. Best surprise robot reveal ever! 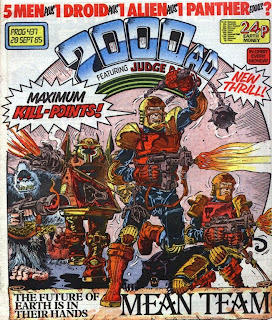 His one episode of Judge Dredd is notorious for including a drawing of the man’s actual face, deemed so off-model by Tharg that it was censored, and he never drew the strip again (although he’s drawn Dredd plenty of times, and perfectly well, if you look at his montage covers and star scans). That one mis-step aside, it seems there was almost nothing the man couldn’t tackle. Inferno mixes futurecycle/sports action with gruesome death, especially by fire. Blackhawk transitioned from Gladiatorial arenas to alien worlds. 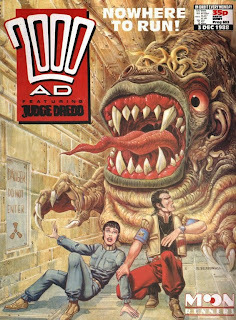 Meltdown Man required the invention of a new Earth with a whole range of habitats and fun with humanoid animals. 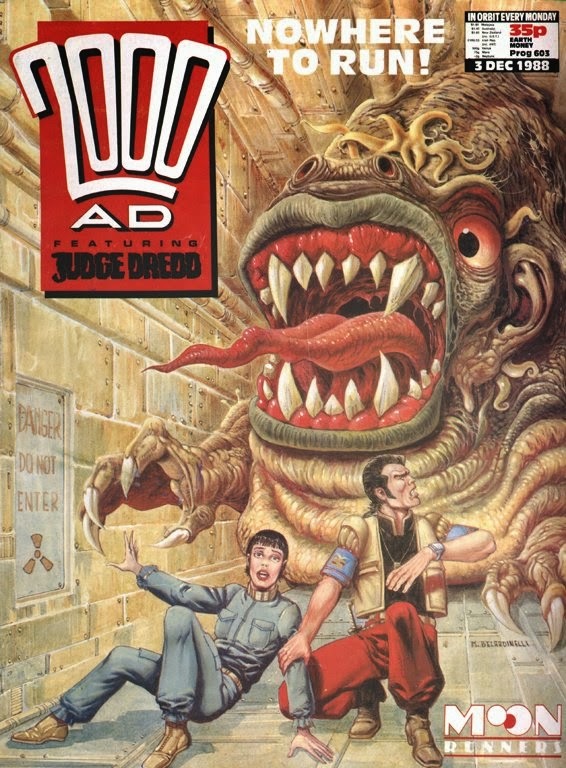 Ace Trucking Co, at times, felt like Wagner and grant were trying to outdo each other thinking of insane things for Massimo to draw, such as the planet entirely covered in wriggling worms. No sensible discussion of Massimo Belardinelli can end without talking about The Dead. It’s a bizarre and divisive story that is amazingly pretentious, but also incredibly funny, and desperately weird. It’s Peter Milligan all over (and we’ll get to that mad genius soon enough). But it’s also quintessential Belardinelli. I don’t know what panel descriptions Milligan provided, but the design of Fludd and his cohorts is a staggering work of heartbreaking genius, as the saying goes. Ace Garp – honestly based on the art alone it’s hard to pick a favourite. Too many Bams, perhaps, with its mini-Massimo and his whirling companions? I love The Croakside Trip, too. 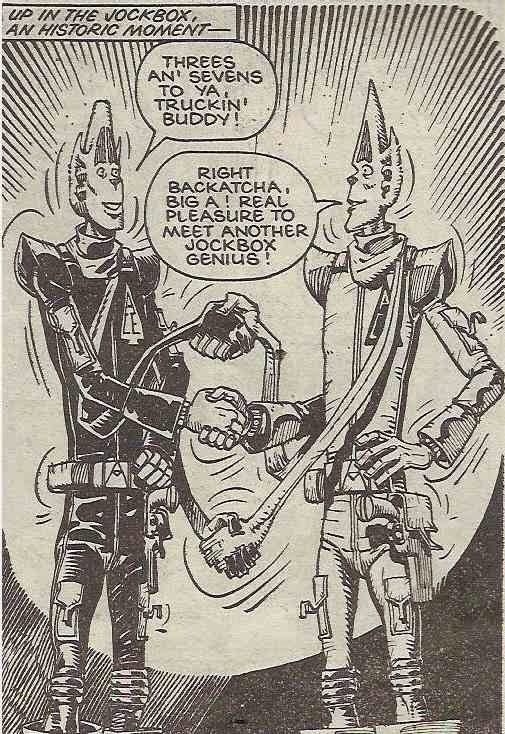 The fanboy in me has a tremendous soft spot for that one episode where Tharg pulls Ace out of a drawer full of forgotten 2000AD characters. Mr. Macabre, a neat-little one-off that has stuck in my mind more than many others. Still Life, a blinder of a Future Shock about creation and art that works because the script is great, but sings because of Belardinelli. And there's a Facebook tribute page, too. Bingeing on Belardinelli is like eating a boozlbug. Whooosh! *The key example of expressionism that I was taught at school was van Gogh’s wicker chair. Its proportions are all wrong, but it really gets across the chairiness of the chair. **Huge props of course to writers Wagner and Grant, who were having as much fun with the names as Belardinelli was having with the designs. ***The effort required to sort out that mess of creator credits is beyond me for the time being! 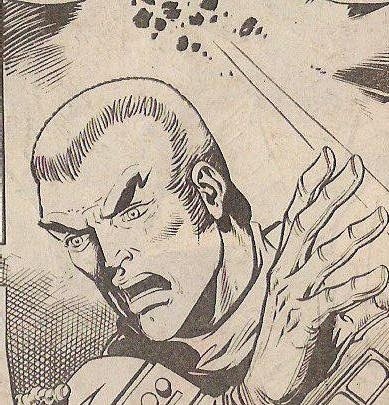 I think the main "deficiency" in Belardinelli's figures is that, even when drawing heavily muscled characters like Slaine, he wasn't very good at making them macho. 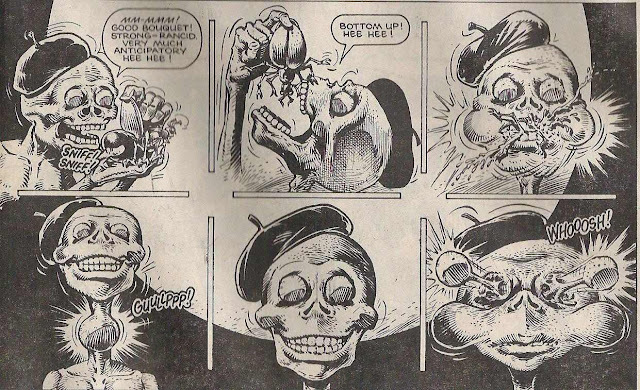 2000AD is, for better or worse, a very macho comic, but Massimo was sensitive. You make a good point, and make me like Massimo all the more, too! Obviously I have a deep love of macho comics characters, but I'd like to think I'm sensitive, too. Makes me appreciate the pairing of Bad Jack Keller and Henry Moon all the more - the ultimate macho man with the world's most sensitive soul.